The board granted the request of the petitioners, but called the new township Corliss, in honor of E. E. Corliss, one of the earliest settlers of the county and now custodian of the State House at St. Paul. The name Adams could not be used for the reason that it had already been applied to another township in the state, a fact not known to the petitioners. The first settlers in this township in many cases came from other parts of Otter Tail county, being drawn here on account of the cheapness of the land. The most enterprising of these early settlers were those who signed the petition for the organization of the township in 1884. This township has no urban centers and not even a townsite has ever been platted within its limits. For some years a postoffice by the name of Woodland, located in section 3, was maintained but since the introduction of the rural free delivery it has been discontinued. No railroad reaches this part of the coutny. The nearest trading center is to be found at Perham. Topographically this township presents no unusual features and for the most part its entire area is susceptible of cultivation. One lake only is entirely within the limits of the township, although there are four lakes which are on the township lines, namely, Little Pine, Big Pine, Bear and Edna. 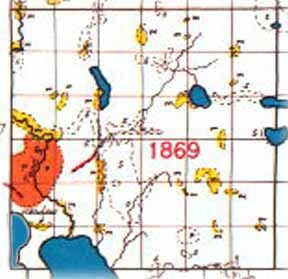 Indian lake, the one lying wholly within the township, was formerly more than twice its present size, extending to the north for at least a mile through sections 8 and 5. Another vanished lake is found in sections 11 and 14. Practically the whole township is within the basin of the Red river. Three streams of considerable size drain in the general direction of Big Pine lake through which Red river flows. The largest of these three streams is Toad river, which rises in Becker county and flows in a southerly direction near the line between Corliss and Gorman townships. Corliss township has one church, which is located in the western part of section 114. There is a cemetery adjoining the church while another burial ground is found in the northeastern corner of section 35. On the banks of Toad river in the western part of section 29 a gristmill has been operated for many years. A sawmill located in the northern part of section 2 has done a flourishing business for many years. Some idea of the nationality of the people of this township may be gained from a glance at some of the landowners whose names are taken from the 1912 atlas of the county. They follow: Palubicki, Czopienski, Schatschneider, Eiswoldt, Pancratz, Kantowski, Sczygel, Rekowski, Lamski, Dulski, Shibitzski, Ziolkowski, Henningson, Foerstner and plain John Schmidt. The present township officers are as follow: Supervisors. J. Stoldt, William Schmidt and Herman Rosen; clerk, C. A. Weigelt; treasurer, John Fiedler; assessor, John Fiedler; justices, Sam G. Wallace and William Ebeling; constables, Emil Mieschke and Henry Meier. Places of birth for Corliss Township in the 1905 state census.